Music is a part of our every day life. 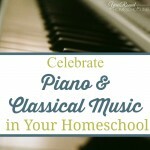 Now that our oldest has started piano lessons, it has become even more a part of our homeschool day. Our other three children crowd around the piano listening to him play and cheer when he finishes a song. Quite frankly it makes my heart happy. 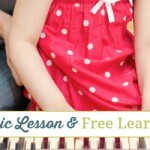 There is so much to learn when you first begin piano lessons – how to hold your hands, keep your fingers curved, note names, symbols, rhythm and more! It’s a lot to learn for little ones. While he is doing great and really enjoying the playing part of music, I noticed that he’s not really remembering note names, symbols and other such vital information when learning music. (He takes after his father.) Being the music major I am, I can’t let him continue without making him learn them. 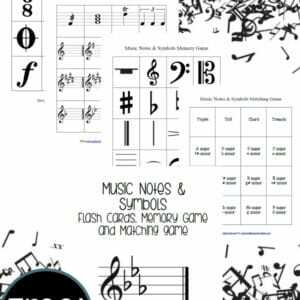 So, what better way to learn the theory-side of music than with some flash cards and some fun games? Not all kids like flash cards, but they are a great way to memorize all the notes, symbols and especially key signatures. They can get very confusing, very quickly. However, I recommend starting with just a few at a time and work on adding more as those become easier and more familiar. Music is a wonderful language, but it’s just that – another language. You can’t learn Spanish or French in a day, so don’t try to learn (or teach) music in a day. Take your time and do it slowly and with some fun. If you make it work, they will likely resent learning it and give up. The Memory Game is another great way to get your kids familiar with all the music notes and symbols. Even though it’s just matching the pictures, it will help them get familiar with the notes, key signatures and symbols of music. Finally, the Matching Game. Older kids might enjoy this game more than the matching game. 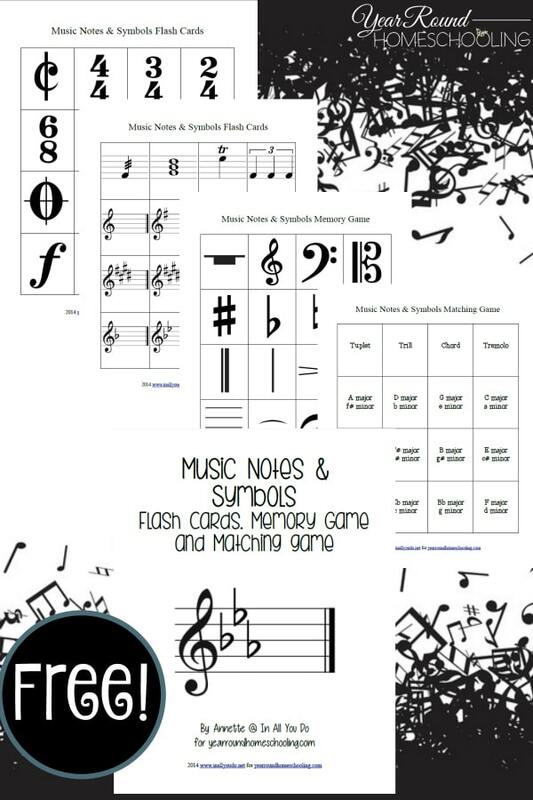 This matching game is a little more challenging since kids will have to match the note, symbol, key signatures and notes on the staff to the correct term or note name. This can be used alongside the Flash Cards to encourage them to really learn the names and terms, not just recognizing them as in the memory game. 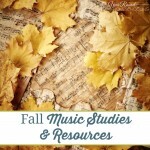 This 42-page printable set is sure to get your kids off on the right track with their music studies. I hope they enjoy them and remember – make learning FUN! 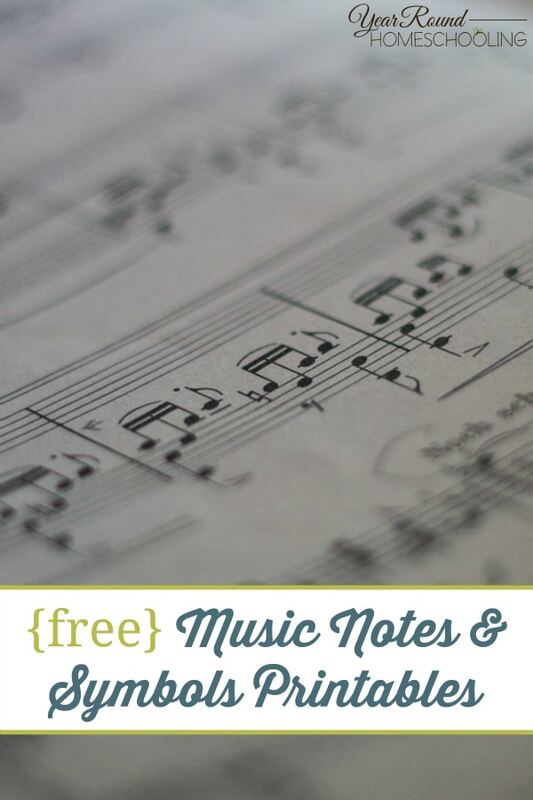 To receive this Free Music Notes & Symbols Pack you MUST sign up to receive our emails below. 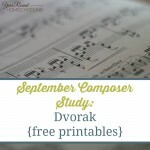 Cool printable! Thanks for creating and sharing. Thank you for sharing. My daughter is only two but I plan on homeschooling her. You are so welcome! I hope she enjoys these!! Great! I plan on teaching this to my little ones!! Pinned. Thanks for pinning!! I hope you all enjoy them! WOW!!!! This printable is awesome and will be such a blessing in my family! THANK YOU!!!! !